Lotus, botanically known as the Nelumbo Nucifera is the national flower of India. The Lotus plant is basically an aquatic plant with wide floating leaves and bright aromatic flowers which grow only in shallow waters. The Lotus plant has floating leaves and flowers. It has long aerated stems. The lotus flowers are extremely beautiful with an overlapping proportional motif of petals. It is considered to be a sacred flower and occupies unique position in the art and mythology of ancient India. This flower has been an auspicious symbol of Indian culture since time immemorial. From ancient times the lotus has been considered to be a sacred symbol in Asian traditions representing sexual purity. It is also regarded as the symbol of purity and divinity by several religions. Hindus relate it to their Almighty, Vishnu, Brahma, Lakshmi and Sarasvati who are often depicted sitting upon this pious flower. As Lotus also stands as the symbol of divine beauty, it is used as a symbol to describe the beauty of Lord Vishnu by referring him as the 'Lotus-Eyed One'. In the Hindu Mythology, the unfolding petals of Lotus signify the expansion of the soul. As the Lotus carries piousness despite growing from the mud, it is said to represent a caring spiritual promise. The Buddhists consider the Lotus Flower to be sacred and auspicious as the flower stands for faithfulness in their religion. 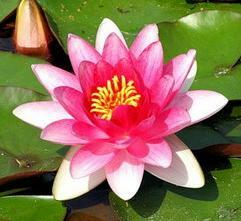 The lotus plant has also been cited as a sacred flower extensively in the ancient Puranic and Vedic literature. Apart from India, Lotus is also the national flower of Vietnam. In Egypt the Lotus Flowers are considered to auspicious because they are regarded as the symbol of Sun God. Lotus seeds are medicinal in nature and are used for the treatment of kidney, spleen, and heart ailments. They are also considered beneficial in the treatment of Leucorrhea, palpitation and insomnia. Lotus seeds are also used as antidotes in mushroom poisoning. The seeds, leaves and tubers of the Lotus Flower are edible.